Analyst: Attackers "needed people on the ground who could guide them"
(CNN) -- The attackers who killed nearly 180 people last week in Mumbai, India, had help from a Bangladeshi national, Indian security sources told CNN sister network CNN-IBN. 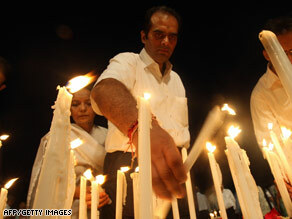 Mourners light candles Thursday during a memorial service for those killed in the terror attacks in Mumbai. The Bangladeshi national bought cell phone SIM cards for the attackers at several locations inside India, the sources said Thursday. SIM cards -- subscriber identity modules -- are portable memory-chips that make it easy to switch cell phones. Intelligence experts say they're used by terrorists to throw their pursuers off the trail. Indian authorities believe all the attackers were Pakistanis, specifically blaming Lashkar-e-Tayyiba (LeT), an Islamic militant group based in Pakistan. LeT has denied any responsibility for the attacks, but the sole surviving gunmen told interrogators he was trained by LeT, Indian authorities have said. Pakistani authorities denied the attackers were from their country, instead blaming what they call "non-state" actors. But one analyst who studies India-Pakistan tensions believes this operation was planned and carried out by militants from Bangladesh, Pakistan -- and India. "They needed people on the ground who could guide them and provided the inside dope," said Shuja Nawaz, author of "Crossed Swords," which analyzes the role of Pakistan's military in the country's politics. "Otherwise, the Lashkar doesn't have the capacity to have cased the joints, to have made all these plans and get these people into the target area so effectively." U.S. Secretary of State Condoleezza Rice, who traveled to the region this week to meet with Indian and Pakistani officials, hit hard on the need for Pakistan to root out Islamic extremists inside its borders. The Pakistani leadership must understand "the importance of doing that, particularly in rooting out terrorists and rounding up whoever perpetrated this attack from wherever it was perpetrated, whatever its sources, wherever the leads go," Rice said. "This is based on a little warning which has been received," Indian Air Force chief Maj. Fali Homi said. "That's all, nothing else. We are prepared as usual." Indian officials are also weighing how to tighten security along their coasts, where the Mumbai attackers entered the country.